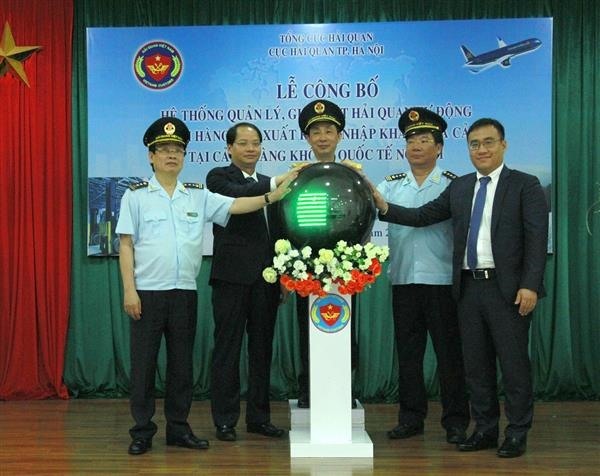 HÀ NỘI — An automated customs control system for exports and imports was launched at Hà Nội’s Nội Bài International Airport on April 16. According to Deputy Director of Hà Nội Customs Department, Trần Quốc Định, after a five-month pilot period, the system had benefited importers and exporters, warehouse businesses and customs because the system links goods management information at three stages: pre-clearance, customs clearance and post-clearance. Accordingly, customs offices applied concentrated information technology to exchange and update information with warehoure businesses, helping them monitor goods from arrival to departure and transportation between locations subject to customs supervision. The system has been piloted by Hanoi Customs Department at Nội Bài Airport since October 16. The air cargo warehouse of the Nội Bài Cargo Terminal Service JSC was the first unit to implement this pilot. Enterprises importing and exporting through automated management and monitoring systems will know goods information and the location of goods in warehouse to speed up customs procedures, helping them reduce the cost and time to store goods in warehouses. Meanwhile, aviation warehouse businesses are provided with goods information through the system. They do not waste time, money or labour to write, print, prepare or deliver documents of each flight to the customs office. NCTS general director Nguyễn Xuân Phúc said his company had made efforts with the customs office to gradually complete software and carry out the pilot. “Up to now, the system has brought practical effects in reforming and modernising the process of operation, shortening time for goods clearance for enterprises and helping businesses reduce labour costs and travel time to handle the procedures, increasing production and business efficiency for importers and exporters,” said Phúc. Appreciating the results of the system, Deputy General Director of the General Department of Customs Hoàng Việt Cường affirmed that this event was not only important for customs but also for all businesses, especially exporters and importers doing business in Nội Bài Airport. “This system has adopted international standards in the management of goods transported by air. This represents the commitment of the customs sector in the process of reform and modernisation,” said Cường. "In the future, units under the General Department of Customs and Hanoi Customs Department should continue to complete the system, expanding it to meet the requirements of reform and modernisation to generate favourable conditions for people and businesses," said Cường. After five months of pilot implementation, this modern system has connected to all three warehouses of NCTS, Aviation Logistics Service JSC and Aviation Vietnam Air Cargo Services JSC.